Madison + Jacob had the most gorgeous beach wedding earlier this year at the Sandbar Restaurant on Anna Maria Island, and we were so happy to get to be there to document their big day! This sweet couple had a picture perfect beach ceremony followed by a super fun reception at the Sandbar, and it fit perfectly with their vision for their perfect wedding day! Our Master Photographer Cornelia was there to capture all the amazing and special moments from the day, and she did such an amazing job! We love all the dreamy pictures from Madison + Jacob’s day, and these are just a few of our favorites that we’re so excited to share! 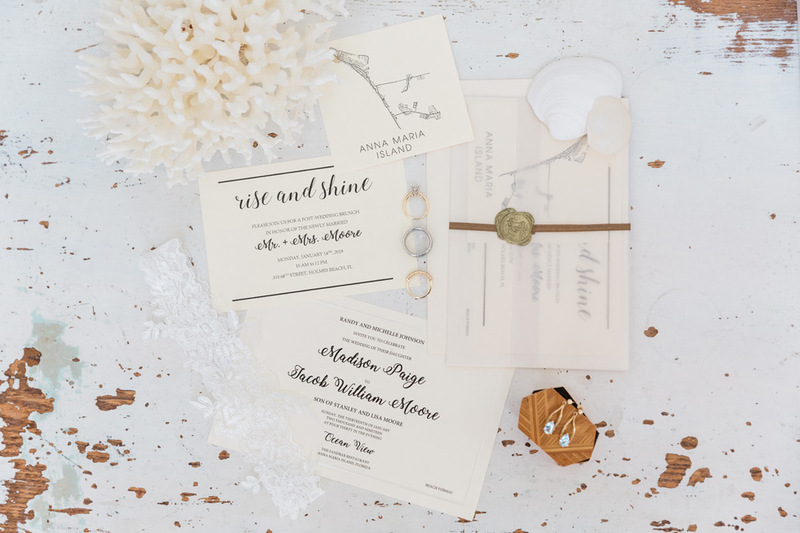 We are loving the gorgeous invitations that Madison + Jacob used for their wedding day! Madison looked absolutely stunning in her wedding dress. We loved her amazing veil that went perfectly with her dress, and the gorgeous tropical greens in her flowers matched perfectly with the beachy feeling of their day! 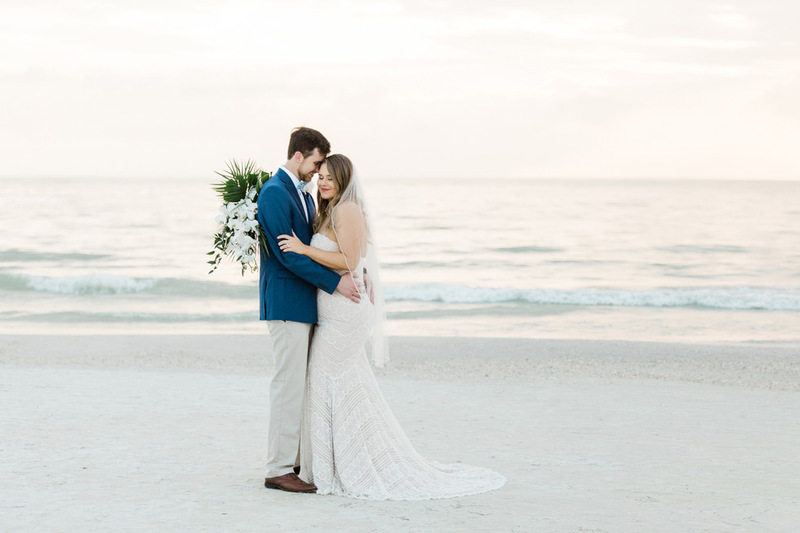 Madison + Jacob were married in a ceremony on the beach in Anna Maria Island. They had absolutely perfect weather for their wedding day!! We love this sweet picture of Madison looking at Jacob during his wedding vows – love was truly in the air! We were able to spend a few minutes with Madison, Jacob, and their bridal party immediately after the wedding ceremony for some portraits on the beach. We love each and every one of these pictures of Madison + Jacob as a newly married husband and wife. They look so totally happy and in love in each one! This picture is so sweet and romantic!! 🙂 Madison + Jacob’s reception was held at the Sandbar Restaurant overlooking the beach, and it was the perfect venue for their celebration! 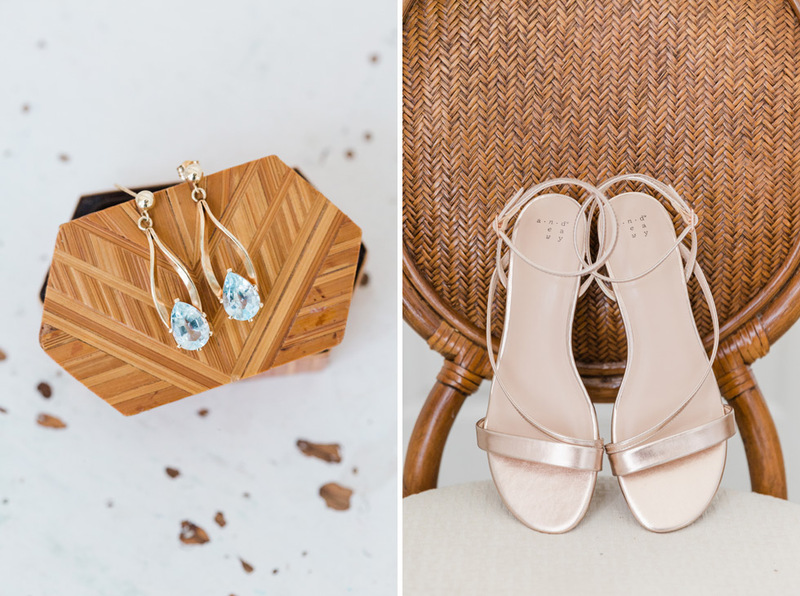 We loved all the gorgeous blue colors that they worked into their reception details – it matched the rest of their day perfectly and was gorgeous!! We had so much fun celebrating with Madison + Jacob, along with all their friends and family who had some out to support them on their wedding day! Congratulations on your wedding, Madison + Jacob! We were so honored to share in your special day with you, and we wish you many years of happiness ahead!